We can read your mind. 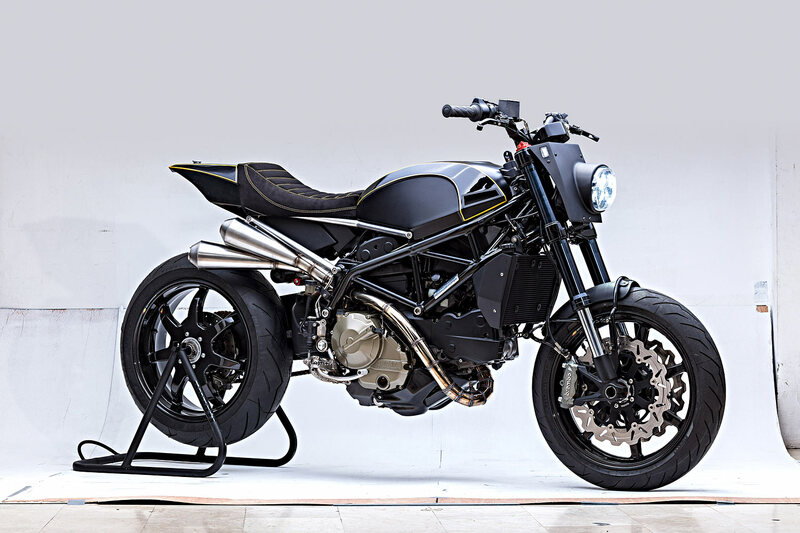 You’re trying to guess which donor Ducati Benjie’s Cafe Racers used to build this, their latest custom bike home run. A Monster perhaps? What about a ST4S? 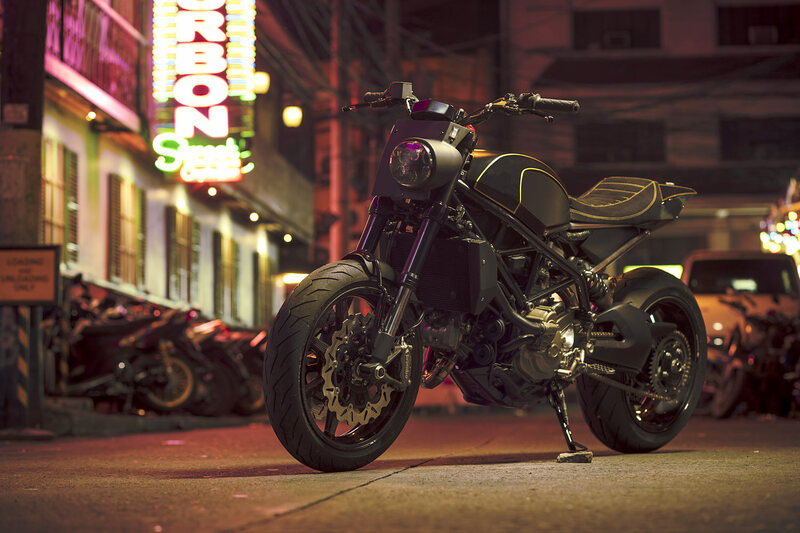 Or maybe a Scrambler? They’re pretty good guesses, but you’d be wrong on all counts. 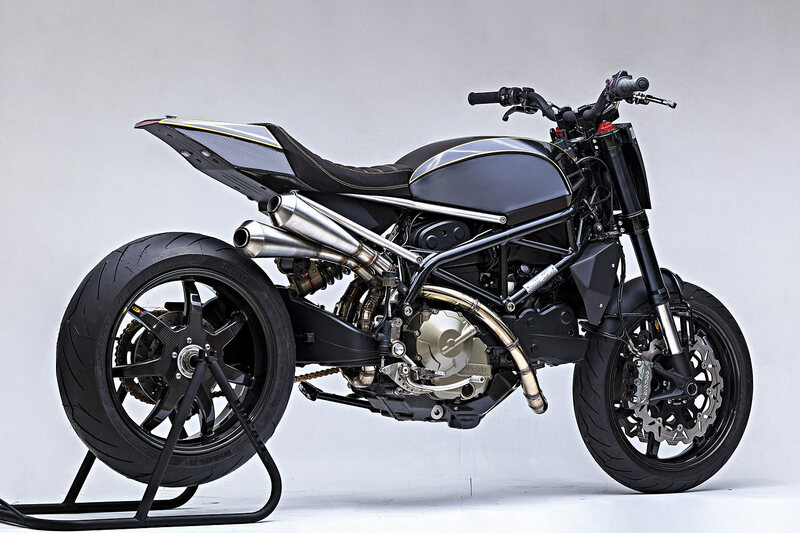 See, this here slick-looking street tracker with serious canyon-carving abilities left the Bologna factory as a 2013 Hyperstrada. 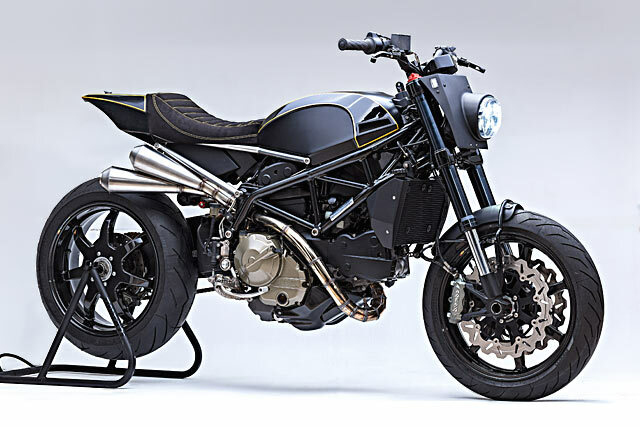 That’s right, a luggage-ladened touring motard styled from a dirt bike became this. 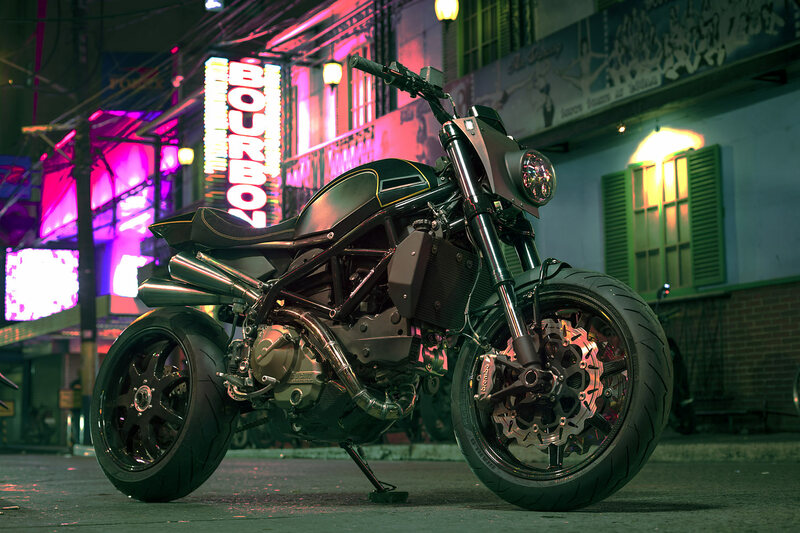 “Redesigning motorcycles is what the BCR team really looks forward to,” says shop owner Benjie Flipprboi. “The planning process, the creativity involved; it’s these things that let us open the doors of the BCR shop every day with enthusiasm for what we do”. The team had recently been commissioned to customise a 2013 Ducati Hyperstrada into something that was more aggressive and lighter, but with a similar riding position. Or as the BCR customer briefed the shop, “A bike that will be ridden regularly in canyon-style road courses and on track days”. 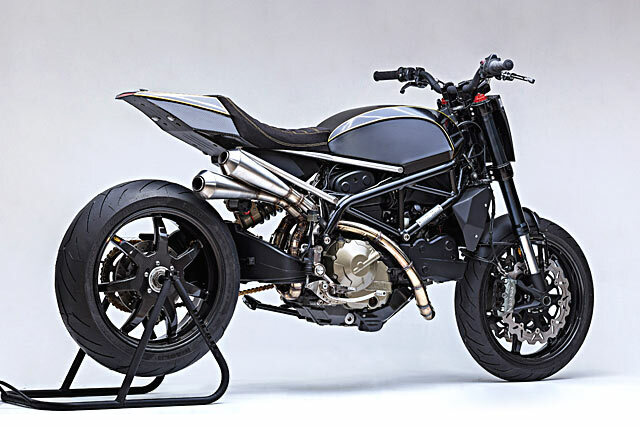 The bike’s owner is an avid Ducati rider, but had grown tired of the stock Hyperstrada’s look. 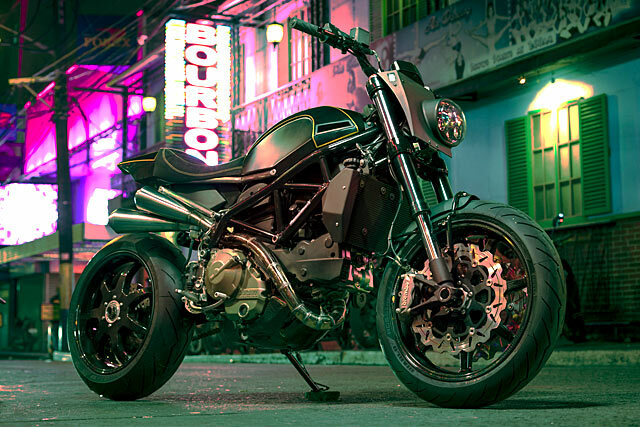 “He wanted subtle, understated beauty but still with a little wow and uniqueness – something bystanders will shake their head in amazement at because they just couldn’t believe that it was a Hyperstrada”. “For most of our builds, we strip the bike back to a rolling chassis and start by designing the tank. 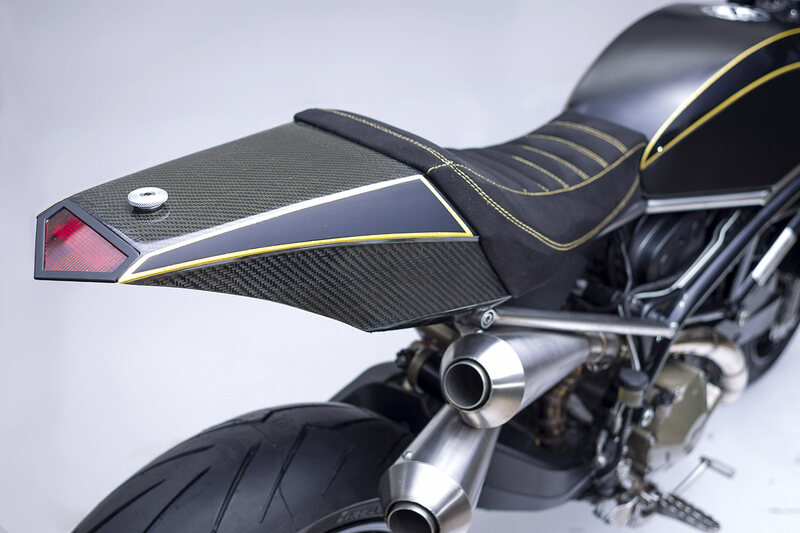 However with this project, we had to start with the subframe so that the seat and tank’s baselines were the same”. Benjie used stainless steel to make it so he could leave the metal raw and unpainted. 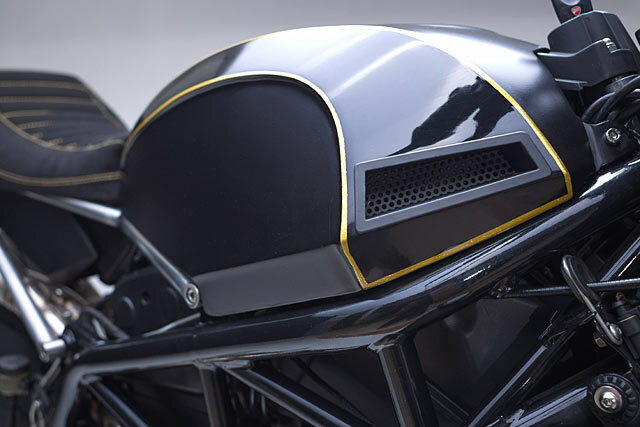 It sits in front of a black aluminium box that neatly tucks away the bike’s electronics, ABS pump, and battery. Clearly happy with what he was able to build, Benjie glows as he describes the process that led to building the tank. “We love this part, because when it’s done right, we get to create something magical. 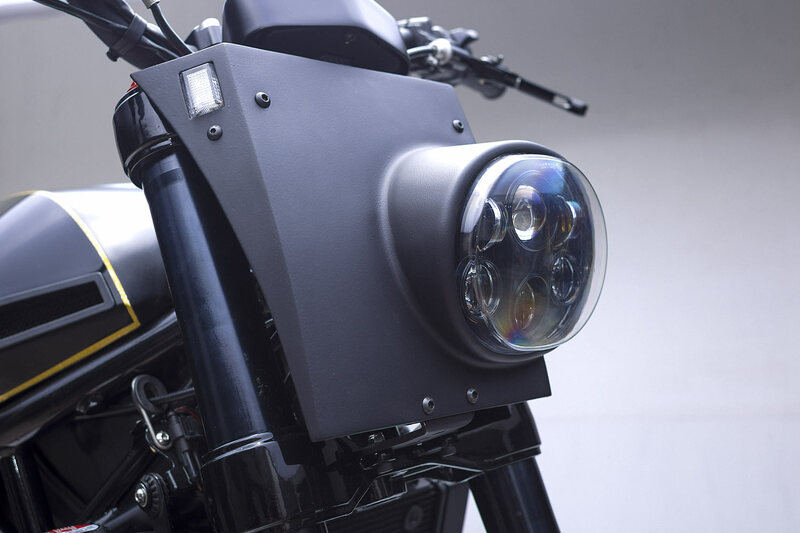 For us, the tank is the centre piece of any custom bike build. 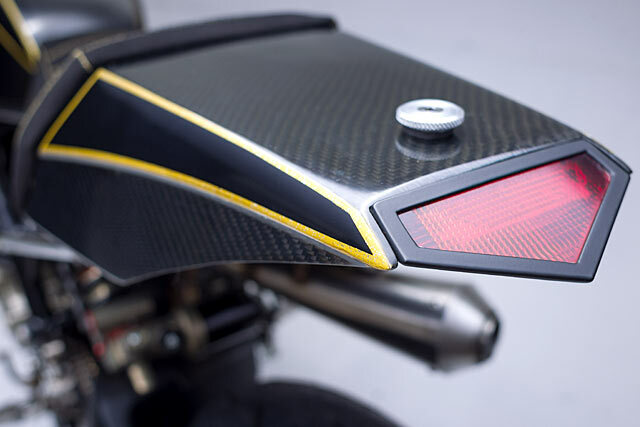 It dictates the overall look and attitude of the bike. Actually, it defines the bike”. 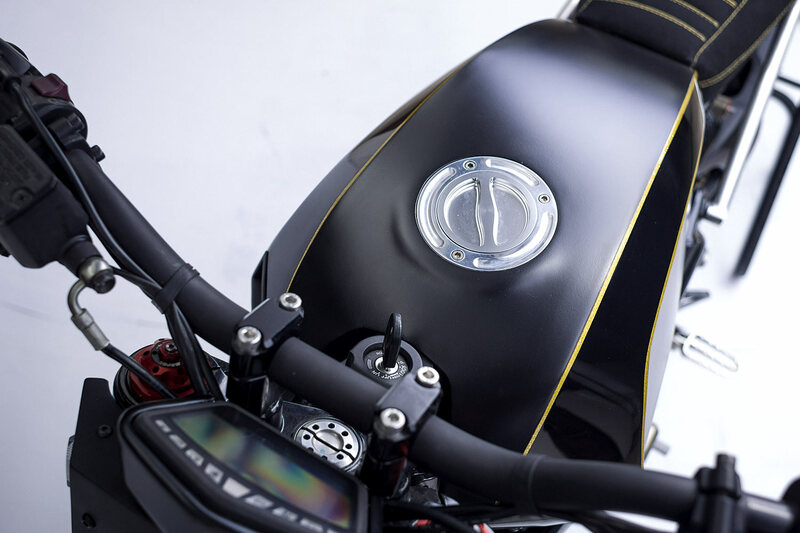 “We wanted a modern look, so we designed the tank to have an angular, stealthy feel to it so that it would go nicely with the stock trellis frame. We constructed it from aluminum and used a keyless gas cap on top. We also added an air intake vent on the throttle side”. The shop usually leaves their tanks bare, but since the bike will be used daily, they painted the tank with a low-maintenance matte black finish with their characteristic gold pinstripe highlight. To blend with the shape of the tank, Benjie designed the carbon fibre tail to be angular as well, with scallop-shape graphics on the side. 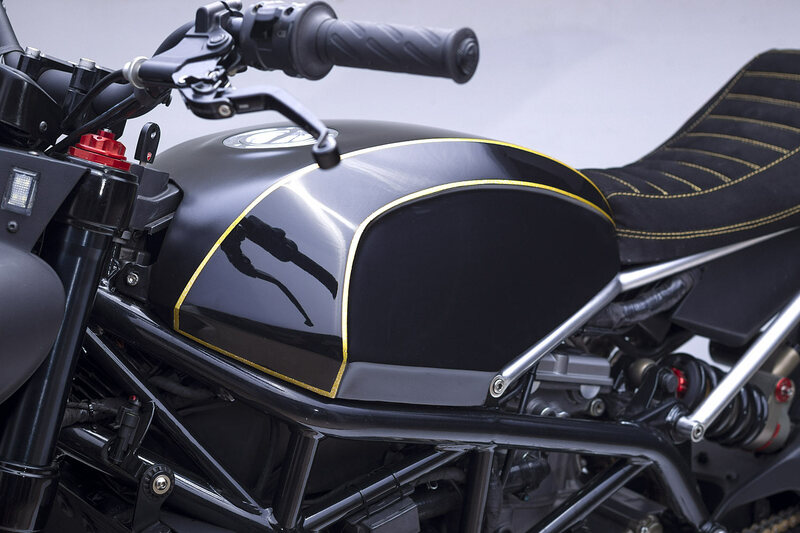 To match the modern material, he then used a black Alcantara for the seat and finished it off with matching gold stitch work. “For the ‘eyes’ of the bike, we decided to do something different. We shaped the fairing fairly flat but with angular cuts to match the overall look and went for a more oval LED headlight with an off centre position”. Beneath, the front fender hugs the wheel with a beefy, looped bracket. 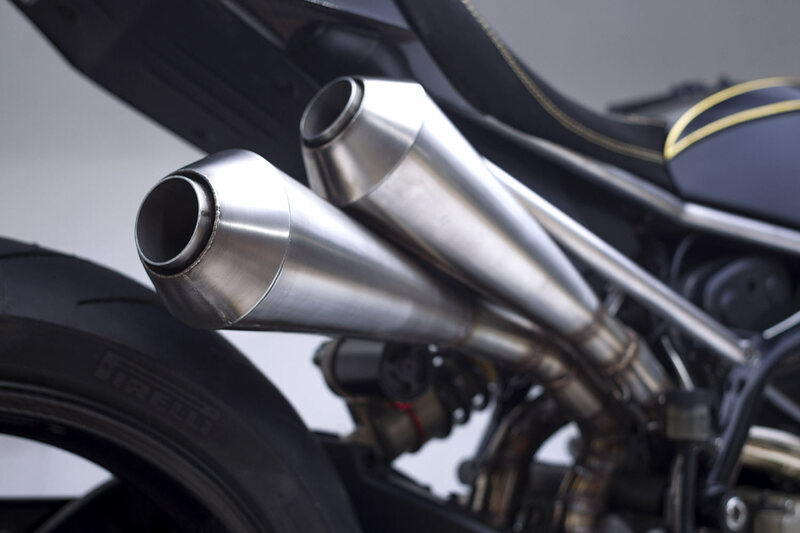 Segmented headers were flagged for the pipes with two staggered, glass packed mufflers out back. And to tune the beast, they installed a Dynojet Power Commander V system. “Clearly, this was now a full ground-up build; we didn’t want to use the stock pegs. So we made our own bear trap-style foot pegs and controls out of stainless with speed holes and machined aluminum ends”. “He wanted something the was set up just for him and his riding habits; a fistful of twisty canyons and the odd weekend race meet”. After extensive experience with the Ducati’s stock factory shocks, the owner clearly wanted something more suited to his own needs. He wanted something the was set up just for him and his riding habits; a fistful of twisty canyons and the odd weekend race meet. Benjie scratched his itch with an Italian MUPO Race Suspension rear shock and matching front fork cartridges complete with variable adjustments. These, paired with some awesome carbon fibre wheels by BST saw the bike drop substantial amounts of unsprung mass and gain some seriously good looks, too. 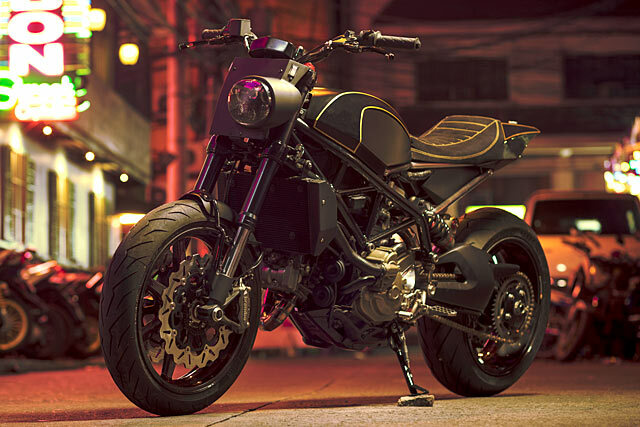 “Transforming this Ducati was a lot of fun,” concludes Benjie. “In a way, this was really our dream build. We were given creative freedom, we were able to design it based on our imaginations, and we were able to use race spec parts and modifications. The end result is a totally unique look with an aggressive sound and race performance”. We’re guessing he’s pretty happy with what he’s done. And with a bike that looks and performs this well, who wouldn’t be?